One of my favorite things about the world of food blogs is being inspired by other people’s recipes – and then tweaking them out and making it your own. While I was in the midst of my starvation diet juice cleanse, I came across a recipe on Kalyn’s Kitchen that really jumped out at me. I am a sucker for anything with hearts of palm in them…and the combination of heart of palm and avocado was too much to resist. As soon as I was sprung from food jail, I was going to make this dish. Sure enough, I used her recipe to break my fast. I stayed pretty true to her recipe, although I did make two changes. I omitted the pine nuts because it did not call for them to be toasted & I’m not a big fan of them just plain. I bet they do add a slight crunch to the dish. I topped my salad with shrimp I sauteed in lemon, good EVOO, oregano, and red chili flakes and then let cool. This was DELICIOUS! A great summer entree salad…or do it without the shrimp as a great warm weather side. Thanks, Kalyn! Slice hearts of palm and put into bowl. Dice avocado and add to hearts of palm, pour over 2 tbsp. of dressing and toss. Coarsely chop lettuce and arrange on individual plates. 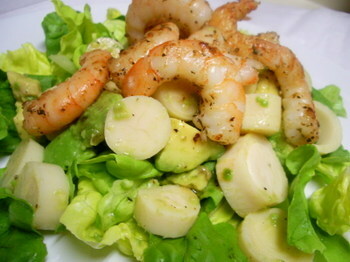 Arrange avocado/heart of palm mixture over lettuce. Dress with additional 1 tbsp. dressing on each salad, sprinkle with pine nuts, and serve. Excellent! I was planning on a week of eating hearts of palm (penance); another recipe to try. Thanks! Excellent! I’m an unabashed foodie blog groupie and just found yours (from Matt Bites). Sounds perfect for warm weather. Thanks for posting! Another salad for summer (sorry, no hearts of palm) – super simple. Baby spinach, red onions and grilled peaches, with just a touch of balsamic. A little warm goat cheese doesn’t hurt either.